I received a request to see if the visualiser I recently published could a) be used on a split screen with Sonic Pi, each taking up half the screen, and b) be used on a second monitor attached to the computer. I looked at the code, and produced this version which uses a resizable screen, which can also be dragged onto a a second screen monitor if attached to the main computer. The main change is in the initial screen setup. This is now all done in the setup function, not in the settings function which becomes redundant. Also all references to displayHeight and displayWidth are replaced by height and width respectively. A modified Sonic Pi driver program is shown below. 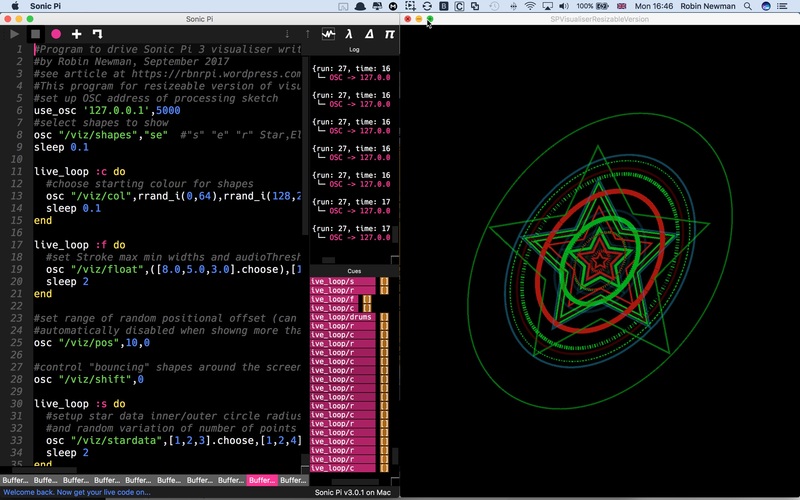 If you are using the original version, I suggest you alter the line that calls the star drawing routine as for the resizable version, and use the new Sonic Pi driver program with it. The original article shows how to set the system up.